Niagara Falls, NY - Niagara Gospel Rescue Mission held a ceremonial groundbreaking ceremony for major upgrades. 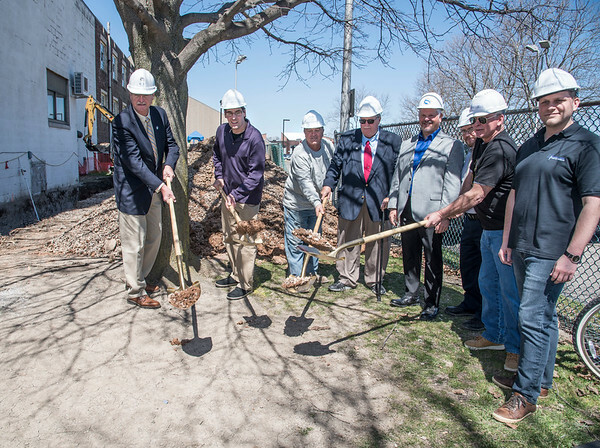 From left are, Niagara Falls Mayor Paul Dyster, board member John Stirling, construction superintendent Franco Lamacchia, board president John Cooper, board member Ron Maines, project manager Joe Long, executive director Geordie Davey and operations director Jaso0n Myers. We are having a groundbreaking for our construction funded by a grant this Monday the 23rd at 1:30 p.m. It's a golden shovel groundbreaking event. I was hoping to maybe have you send a photographer for some pictures and even somebody to cover the event to possibly get a story in the paper. Can we do that? Appreciate you let me know so I can let my boss know. We have invited the mayor although I have not got a response back yet will update you on that as I know. Please get back and advise and thank you.